Many people questioned whether WWE 2K14 would remain the same as the previous title or just how much of a transition would occur. However there appears to be a lot of resemblance to WWE 13, which didn’t come as too much of a surprise seeing as 2K has kept Yukes; the same developer THQ originally had working on the WWE games. So does WWE 2K14 get the title victory or a series of Choke slams to hell? So what are the things that stand out from the latest version? For one it has improved on the reversals. In WWE 13, if you faced an experienced player, it would end up being a constant battle of reversals. Now in WWE 2K14 when you reverse a move it automatically does a damaging move to the opponents, which makes the match run more smoothly. While there aren’t any huge changes gameplay wise in this version there are notable additions, such as catch finishers. A spear to what looks like a mini version of hell. 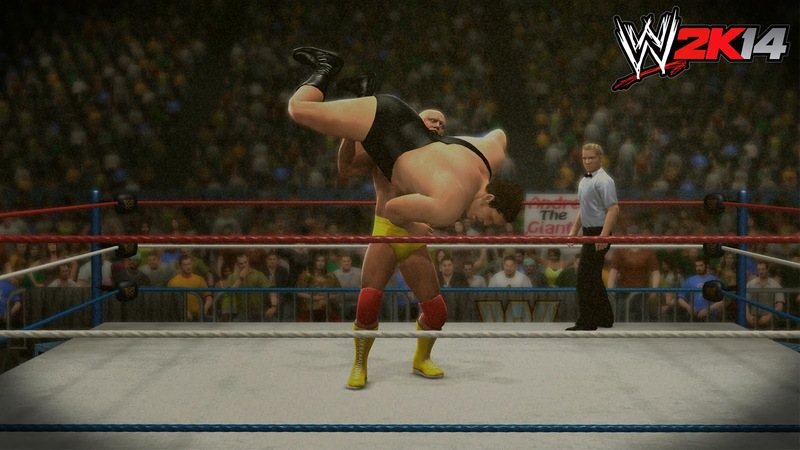 The main feature of the game is 30 Years of Wrestlemania, which allows users to relive and go through the greatest matches and moments in the history of Wrestlemania. Anyone who has played NBA 2K12, will notice that this mode does seem inspired and influenced from Visual Concept’s work on NBA 2K12 NBA’s Greatest Mode. This mode truly is the core of the game and it has done an amazing job of hyping up and celebrating the past, and history of the sports, using video and images. In 30 Years of Wrestlemania you play as the wrestler who was won the match in the past, and have to play the match the way it originally panned out. In every match there are historical objectives, and Wrestlemania moments that gives you the chance to relive the amazing moments from cut scenes that resembles the past so well. Should you complete the WrestleMania moments and all the objectives, including the hidden ones, then you get to unlock; characters, costumes, stages or belts. An iconic match in the history of the WWE. There is another feature where you get to become The Dead Man, The Undertaker defending your streak or ending the streak. In Defend the Streak, you control The Undertaker and constantly fend off countless opponents until you eventually lose. In Defeat the Streak, you challenge The Undertaker in a No Holds Barred match. You’d think with anything allowed that this mode would be a piece of cake right? WRONG!? It can really take a very long time to beat him and you might even end up losing a few times before you manage the feat. The creation modes hasn’t changed much it seems, which could upset some fans since it’s remained the same for quite a while. The addition worth noting in the creation mode is the WWE Superstar Templates, where you can create attires for the Superstars. Dressing them up however you want; as Santa Claus, wearing suits etc. I was quite upset that they took out Custom Entrance Videos, which allowed players to create entrance videos for their own created Superstars. There definitely is an improvement in the online mode as there seems to be less lag issues, which was a familiar problem in the previous titles. This is a great thing for fans as they love to challenge other players and compare each other’s skills. You have the option to play player matches which are non-ranked, or play matches where you level up your profile depending on your in ring performance, which is the ranked matches. Just like other titles which encourage being competitive, there is also a leaderboard for the best players. 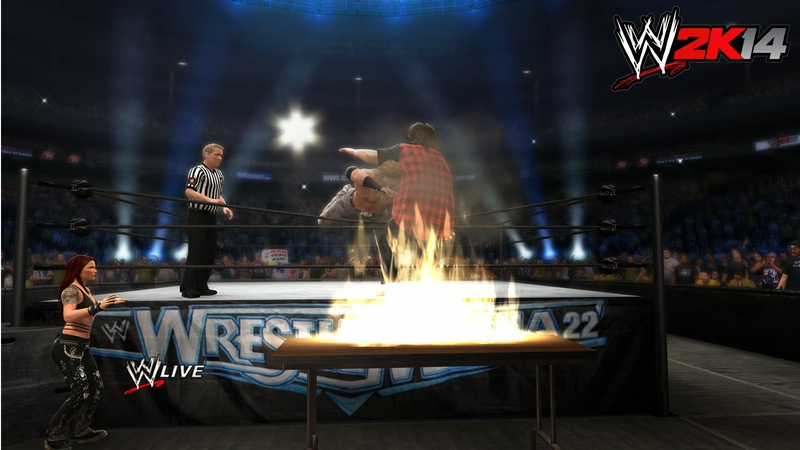 Visually, the game looks much better, but does bring out the déjà vu feeling as it resembles very closely to WWE 13. While these graphics do work, it would have been even better with even more tweaks. This only makes me look even more forward to the next version 2K Sports will bring out. The filters used in 30 Years of Wrestlemania are sheer brilliance, just the simple addition of a filter to the mode made it feel like the past. Filters used to replicate the broadcasts of days past. These filters works really well as the wrestling shows in the past did look quite similar to it. The one thing I hope can be improved is the commentary used and that in the future, there is a lot more variety as it’s very repetitive, arguably the worst part about the game. 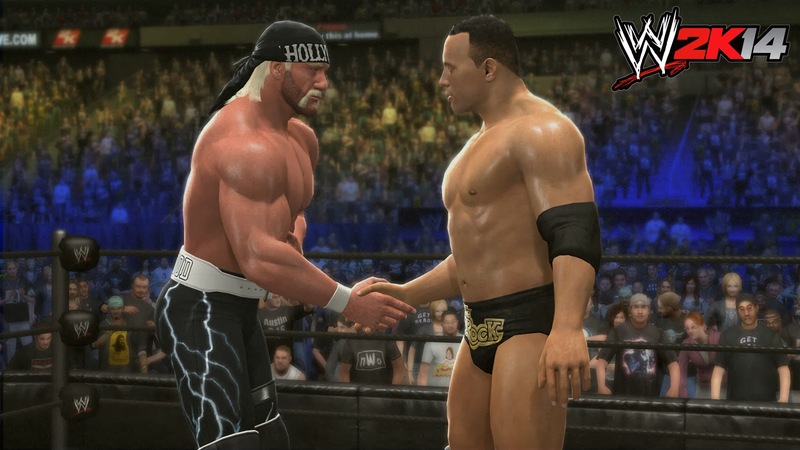 WWE 2K14 can offer you a great gaming experience, which can be even more fun with friends. 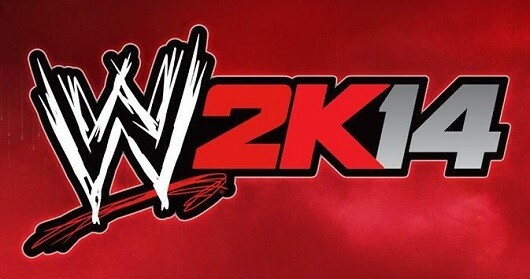 However the gameplay and graphics do still feel quite similar to the previous title, WWE 13. The addition of 30 Years of Wrestlemania definitely made this game a whole lot better and is crucial to how good the game ended up being. The new tweaks such as the reversal systems has made gameplay a lot more smoother along with catch finishers that can cause you to get hype. WWE 2K14 has tried to address their problems with the lag issues WWE 13 previously and it has certainly improved on it. It’s interesting to see what 2K Sports will do with the next version, as this version has certainly given them a great foundation to continue from.